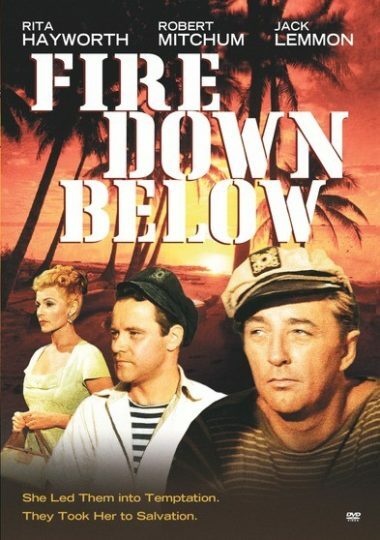 Hollywood legends Rita Hayworth (Gilda), Robert Mitchum (The Night of the Hunter) and Academy Award winner Jack Lemmon (Best Actor in a Leading Role, Save the Tiger, 1973) team up in this high seas adventure tale of smoldering passion and deception, shot on location in Trinidad and Tobago. Hayworth is the torrid siren-turned-sailor who comes between two best friends and sends temperatures rising. When FIRE DOWN BELOW was released, it attracted not only the public’s adoration, but it also had the critics looking at Hayworth for the first time as a serious actress instead of just another Hollywood glamour girl. Newly remastered. Bernard Lee; Herbert Lom; Rita Hayworth; Jack Lemmon; Robert Mitchum; Bonar Colleano – 1957 – COLOR – 115 Minutes.